Disclaimer: I do not own Alex Rider; this is a work of fanfiction and no copyright infringement is intended. Please don't sue me! Summary: Alex is a terrible patient, and Wolf is a worse nurse, but somehow, they get through it. Just like always. ANSet vaguely in my Security / Sanctuary 'verse, but can be read as a standalone. Summary: Wolf intended his courtship to be sweet and traditional. Unfortunately, he's never really been good at either. Both of these were very kindly read over by lullula. Word Count: 500 - 5 connecting drabbles. Summary: Alex has developed techniques for getting through this. He is going to survive this if it kills him. AN: Written for the first series of drabble prompts at alexrider100 (which is an awesome comm that you should all totally join! ¬_¬). The prompts were: Stains, Keys, Razor, Sometimes and Watch. Cross-posted to alexrider100, here and my private journal. Apologies for any spam! alexrider100 is a weekly-prompt drabble community specializing in drabbles of 100 words (give or take). It's all about creativity and fun, so come on in and take a look around (and bring a friend)! Crossposted at ami_n_von, xari_xryso_fic and, mods permitting, yassen_alex. Sorry for any spam! Summary: Alex is newly returned from a mission and enjoying being alive - Eagle is part of that enjoyment. AN: Written for demon_sloth over at xari_xryso_fic. Summary: Alex is sent undercover into Xavier's School for Gifted Youngsters. Well, he's plenty gifted. And maybe in ways unexpected by even himself. AN: Written for agent_jet over at xari_xryso_fic. There are at least two more Alex Rider ficlets to come over there - watch this space! Crossposted to my journal and yassen_alex, if the mods allow. Apologies for any spam! Summary: Tom reminds Alex of all the ways being human, being alive is a great thing. And Alex repays him by making sure he stays alive. AN: Written for lily_kohai for help_haiti. I'm, er, a little slow, it seems. *sigh* In any case, here it is, hon, and I hope you like it! Cross-posted to my personal journal, here and yassen_alex (if the mods allow!). Apologies for any spamming! Warnings: mentions of murder/child abuse; no main character death, however. 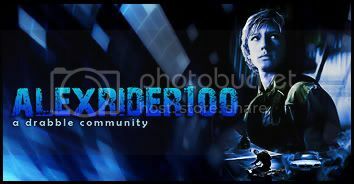 Disclaimer: Alex Rider is not mine and never will be. Summary: For once, Alex doesn't bounce back after a mission, but for once, there's someone there who understands. AN: In my head, this is set in the In Loco Parentis 'verse, but there're no concrete indications - so you can pick the one you prefer. ^_^ Possible OOC-ness depending on how you see the characters and their developement. Link goes to my journal. Disclaimer: Not mine, never was, never will be. Summary: Wolf and Snake talk about Alex coming to live with Wolf, and Wolf starts to notice a few of the more obvious issues in Alex's life. AN: Set in my In Loco Parentis universe, around chapter 5 - a missing scene. Link goes to my journal. Fic-Verse: Also set in my In Loco Parentis 'verse. Summary: Eagle wants to know why Alex never calls them by anything but their codenames, but this devolves pretty quickly into just teasing him. AN: Written after a conversation with Von about written a long time ago to deal with an issue which isn't an issue anymore. ^_^ Last of the reposts! Once again, please forgive the style issues. Summary: Alex and the Doctor travel to a distant planet and Alex is taken in by the locals. This page was loaded Apr 20th 2019, 6:29 pm GMT.